Hi all! Friday night at the Ronald Reagan Library in Simi Valley, Anderson spoke to a sold-out crowd estimated at 950 people. 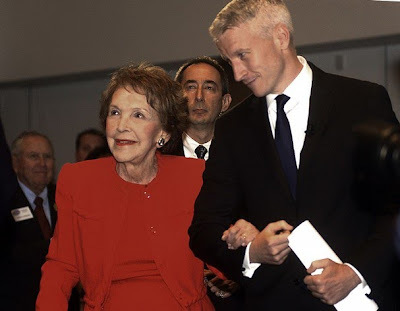 The evening began with Anderson escorting Nancy Reagan into the auditorium to a standing ovation. After a glowing introduction from the Executive Director of the Library, Anderson received another ovation as he stepped to the podium. He first joked about the last time he had been there, when he hosted one of the presidential debates there in 2008. He told the story of Gov. Arnold Schwarzenegger 'complimenting' his biceps, and also that he and Mrs. Reagan happened to be wearing exactly the same outfits as they had that night. As usual, he started his talk with a bit of a biographical sketch of his career and how he became a journalist. We've heard the stories before -- his mother's advice to "wear vertical stripes" and "follow your bliss," the fake press pass, traveling to Rwanda and Somalia in search of people who "spoke the language of pain" in order to learn how to cope with his brother's suicide. He then talked about Haiti, saying that every day there is a struggle, and quoting some of his "Reporter's Notebook" observations of his time there. If you follow Neil Hallsworth on Twitter, you know he caught the bug referred to by locals as 'Aristide's Revenge.' Well, Anderson caught it, too, of course... and he also said he thinks he's still coughing out the Kandahar Krud from his trip there in December! He talked about how the job of war correspondents has changed, how it is now necessary to have bodyguards and how easy it is to get stuck in that bubble of security and miss the real story. 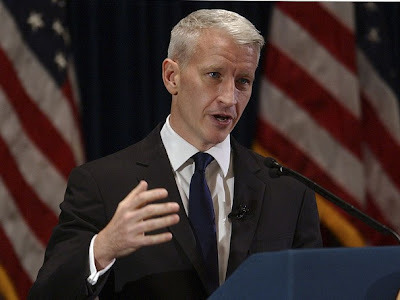 Anderson also talked about the fact that the wars in Iraq and Afghanistan have vanished off TVs and his concern that the same will happen with Haiti. He compared it to Katrina, asking whether anyone remembered the name Ethel Freeman. (I did, thanks to Anderson's coverage...) He told the story of her death at the SuperDome, how her son had to leave her body in a wheelchair, covered by a blanket, when he was finally evacuated. How there is no marker on that spot to mark her passing -- he checks whenever he visits NOLA -- and said that while government failed after Katrina, citizens did not. I was in Iran in 1994. I was there for four days and I was arrested for three of them. I didn't really get a great sense of Iran. But it's funny, I didn't really do anything wrong, I went out of my hotel without my government minder and I was videotaping kids playing badminton in the park or something, something totally innocuous. I was just talking to people. And this is when I was by myself. And really, there's nothing worse than getting arrested in Iran when you're by yourself. It's not the place you want to be arrested. But as I was being taken away to a police station, I'll never forget, a man grabbed my arm and whispered in my ear, "Viva America." And I was, like, "Oh, okay, thank you, bye!" He spoke for 48 minutes, and was very engaging and both serious and funny. Afterwards, according to staff members, he went to an invitation-only dinner hosted by Mrs. Reagan for about 100 supporters of the Library. Cyn, thanks so much for your write up about Anderson's speaking engagement. The helicopter almost colliding with another one is scary. And it probably had to be really scary for Anderson. I like that he feels by being on 60 Minutes he is becoming a better reporter. His 60 Minutes pieces are very good as he has more time to tell a story, which he is so good at. The lecture seems to have been very interesting! I would one day attend a lecture by AC and in this particular case, with the presence of Nancy Reagan, would be extraordinary! Cyn, thanks for sharing with us! Thank you for the write-up, Cyn! He told the badminton story on Letterman years ago, and he's downgraded it a bit. It was actually a group of ladies playing badminton, in full Islamic dress (he made the mistake of saying they were wearing burquas, which of course are not worn in Iran so he took some flak for that one at the time). He figured that this would be an interesting thing for Americans to see, I guess to highlight how people in this culture are both very similar to us and very different--so he started filming them and he got arrested. Not only did he sneak out of his hotel in search of things he that he could film (and people he could converse with) without being supervised or controlled, filming women in Iran without permission is probably a lot less innocuous than he's making it out to be, considering their culture. Of course, I do find this treatment--and the fact that the minder was required--to be ridiculous, but that's Iran for you. They threw him in jail for three days, but he said (this part amazed me) that they let him go back to the hotel at night. So he said he felt like Otis from "The Andy Griffith Show." Thanks Cyn for the great reporting. I'm jealous that you had the opportunity to hear him speak in person. I want my turn! Cyn: Thanks for the report on AC's lecture and the photos came out great. This post was both timely and relevant and I miss your blogging. Good to see Nancy in red attire again after so many years and she looks good. Having heard AC speak in person he is just as compelling as he appears to be on television. I also like the fact that he feels by being on 60 Minutes he is learning how to be a better reporter. AC is a work in progress. Thank you, Cyn. I was there too and the Reagan library is incredible. Anderson was very personable and his voice was so warm. Anderson said Nancy Reagan sent him a handwritten letter so he had to accept her invitation. He discussed moderating the president nominee debates and how each candidate had a different method getting his attention from raising a finger to waving wildly. Despite the disaster in Haiti, the government still had time to stamp his passport. During the Q & A, his hand were very animated. He made a remark about how our humanity is as thin as the chambers in the human heart. He is a great speaker and really engaged the audience. I am so glad there are people like Anderson in the world who bring us these stories. It's interesting that he mentioned how easy it is to get caught in a security bubble. Guess it takes a lot of experience to understand the delicate balance of too much or not enough security. @Cyn and the "Breaking News" -- we will be covering his appearance on Charlie Rose on ATA. Hopeing one of these days I get a chance to hear Anderson speak in person. Glad you had a good time, Cyn. I hope AC will broad his horizon. Thank you Cyn. You are so lucky to have attended this event. The pictures are great and I bet the memories are even better. If someone missed the Charlie Rose Show you can go to the program's website or through the PBS website. There you can view the entire program a few days afer it airs.